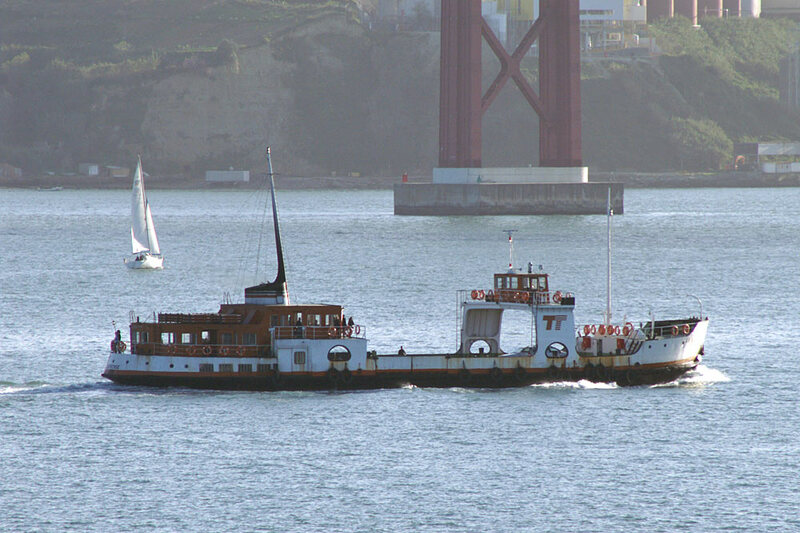 This page shows the combined Lisbon fleet of Transtejo e a Soflusa in 2008. 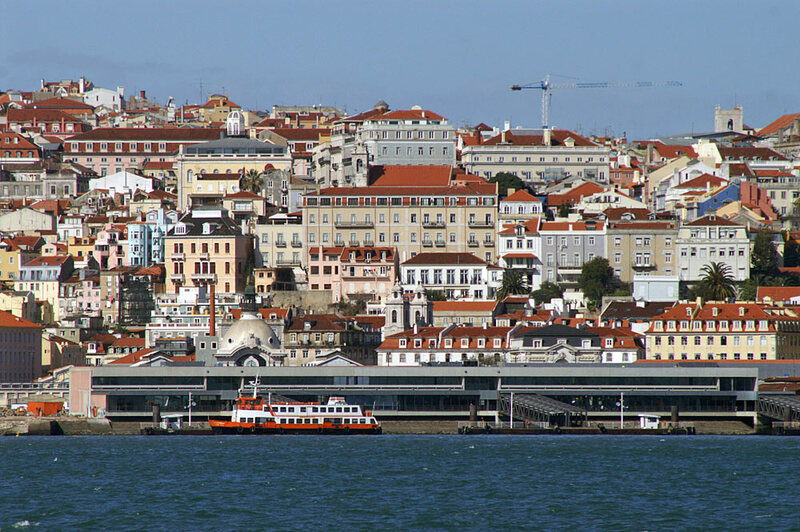 Lisbon has a superb location on the River Tagus, and there remains an intensive network of ferry services across the river, despite the imposing Ponte 25 de Abril bridge which links the two sides and carries both rail and road traffic. 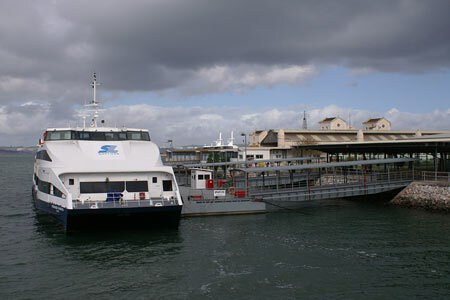 Even a car ferry service has survived the arrival of the bridge, unusual in such circumstances, and the ferries on this route are of an extremely distinctive design. 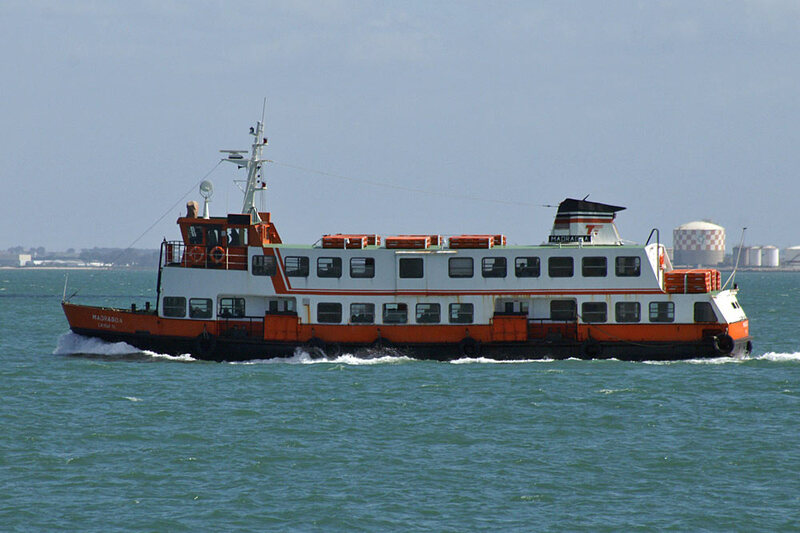 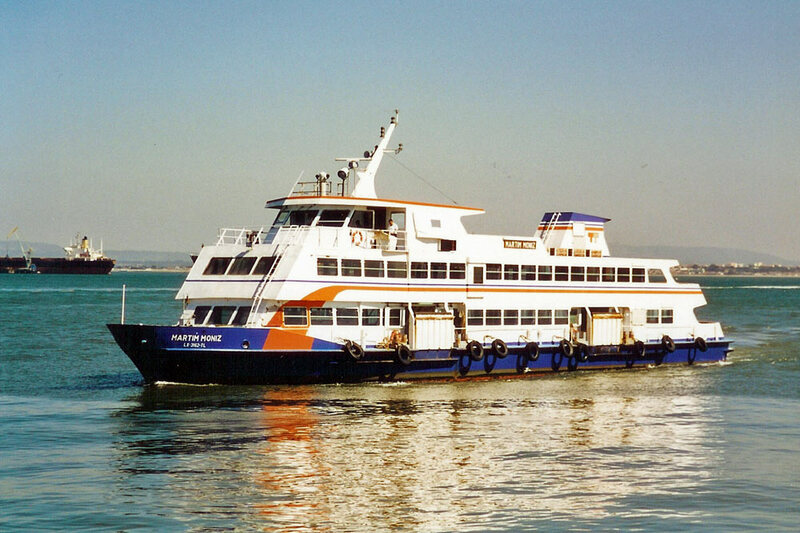 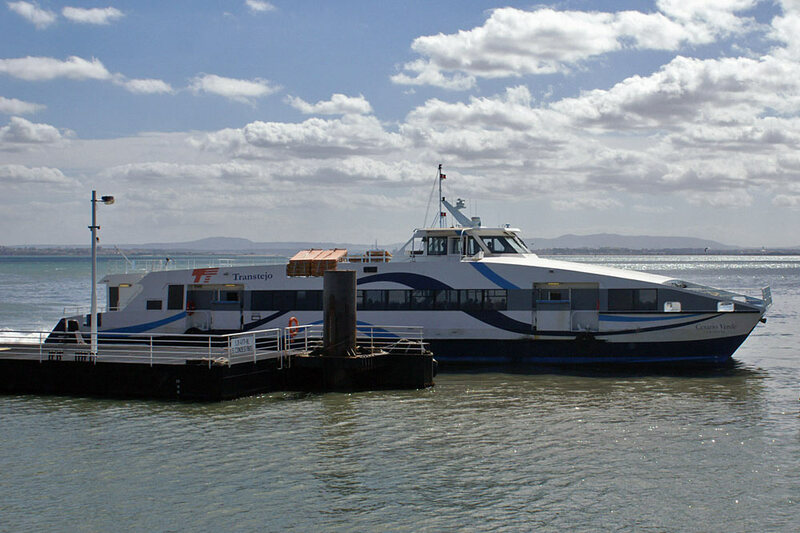 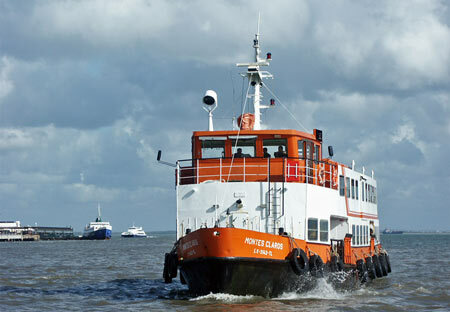 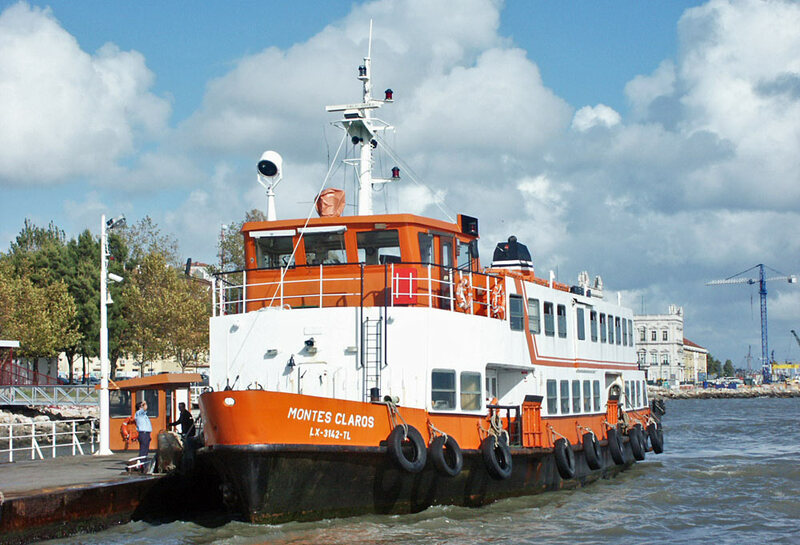 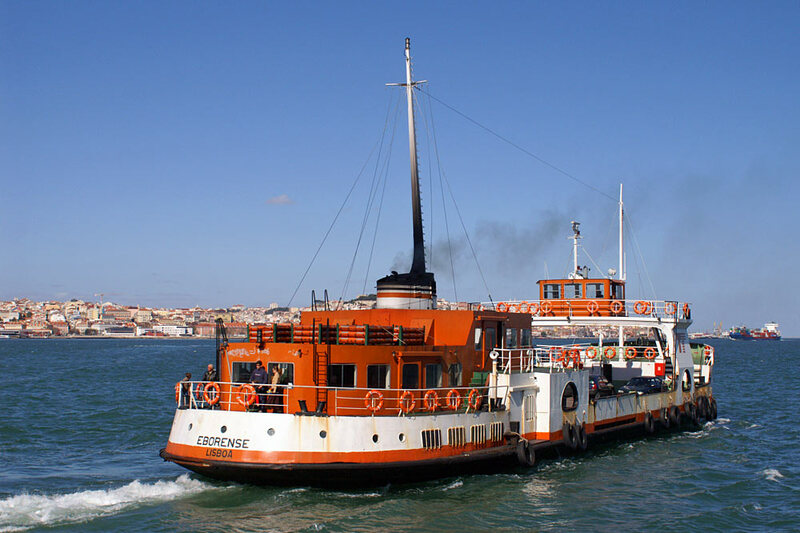 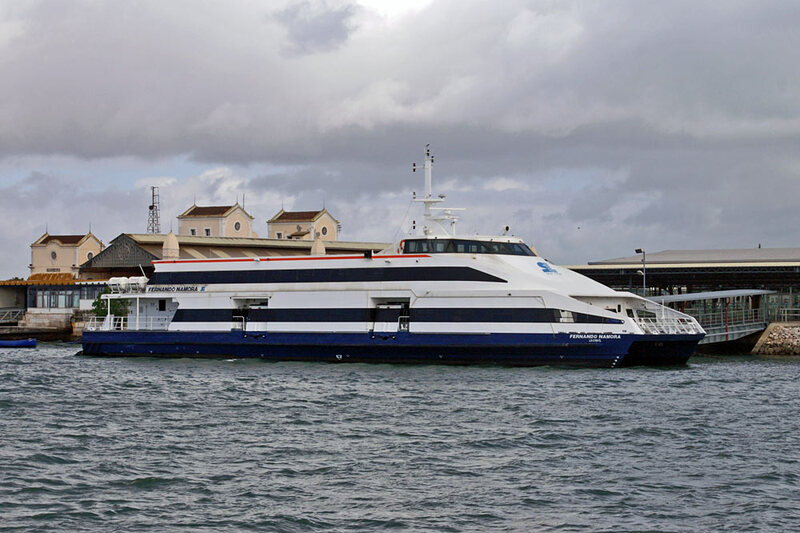 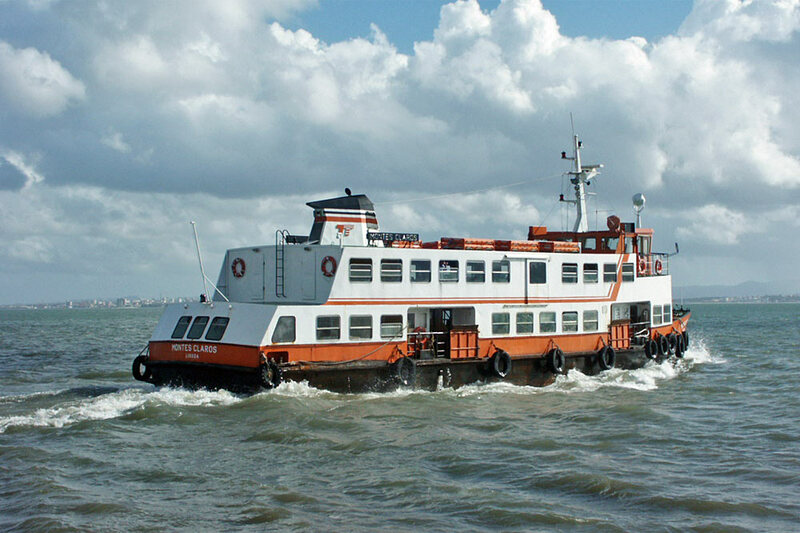 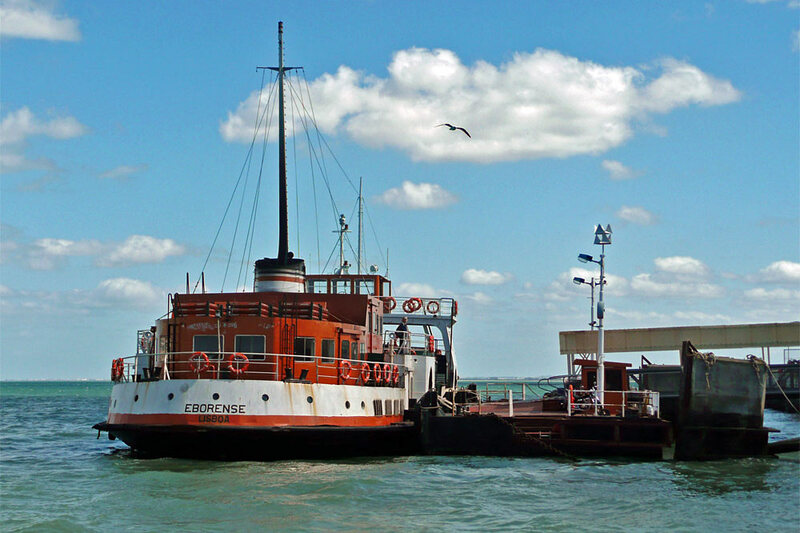 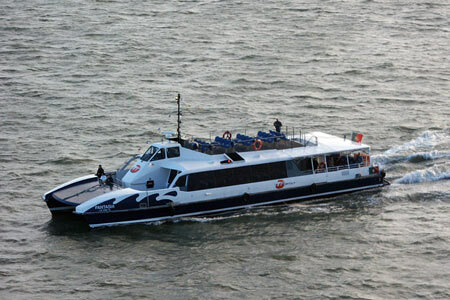 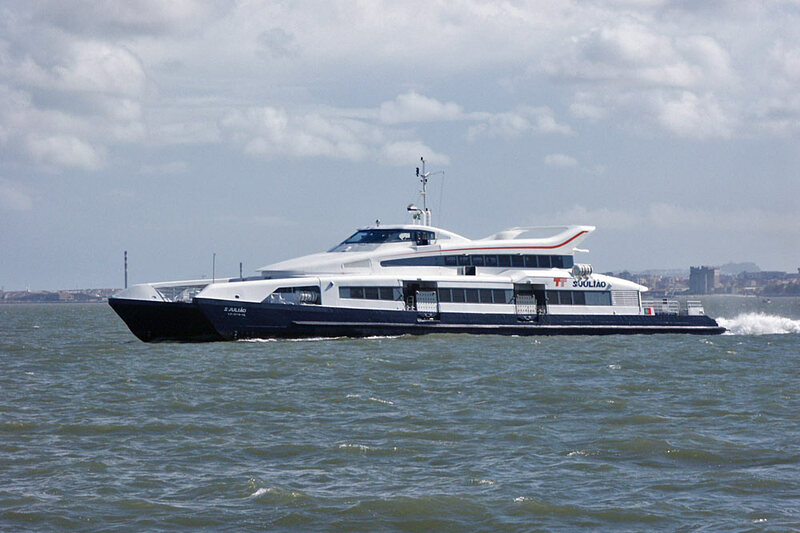 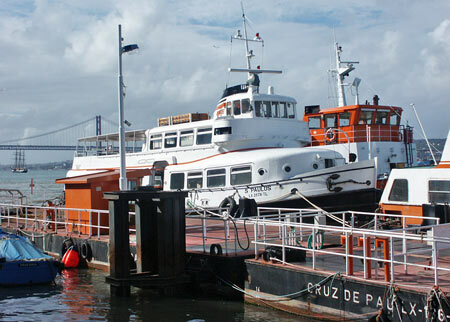 The car ferry now runs between Belem and Cacilhas with the two remaining ferries Alentejense and Eborense, replacing the two routes Belem-Porto Brandao and Cais de Sodré-Cacilhas, for which Monte Pragal and Sesimbrense had been retained. These have been withdrawn since 2005. 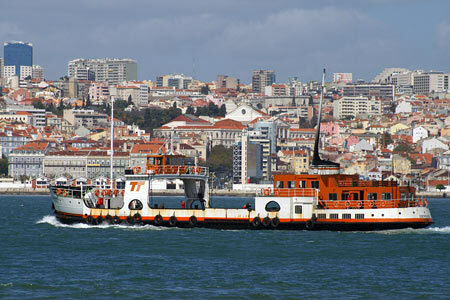 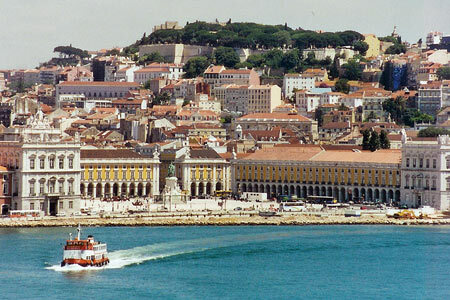 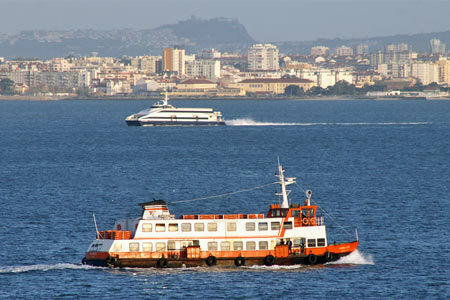 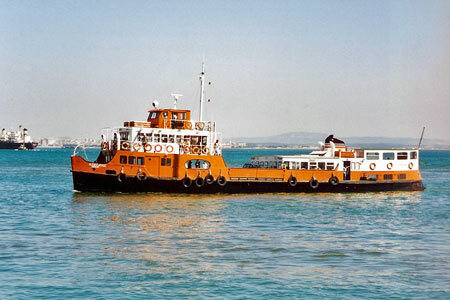 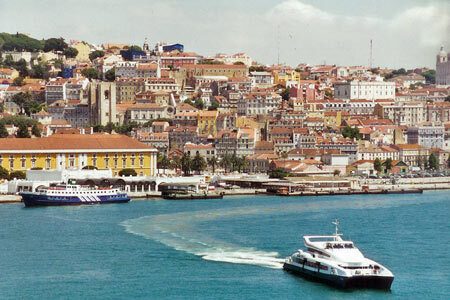 Since 1975, the Lisbon ferries have been operated by two companies, Transtejo and Soflusa (originally Portuguese Railways (CP)) These are now combined as Transtejo e a Soflusa. 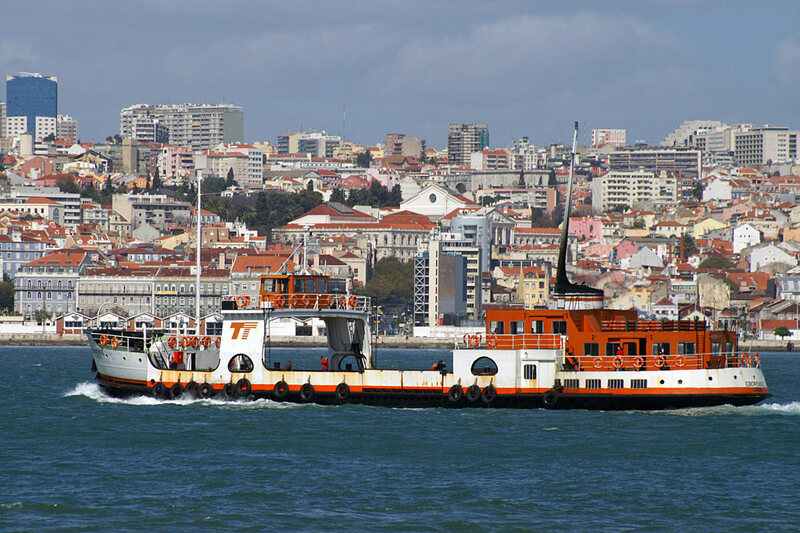 Transtejo (Transportes Tejo) operated from three ferry terminals on the north bank of the Tagus:- Belem, Cais de Sodré and Cais da Alfandega; operating routes to seven terminals on the south banks with a fleet of around 30 ferries. 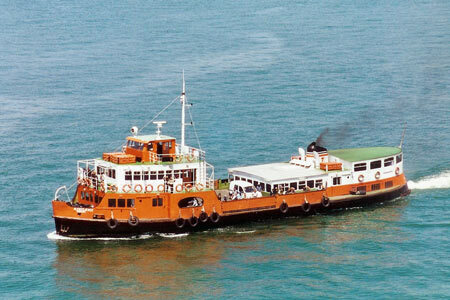 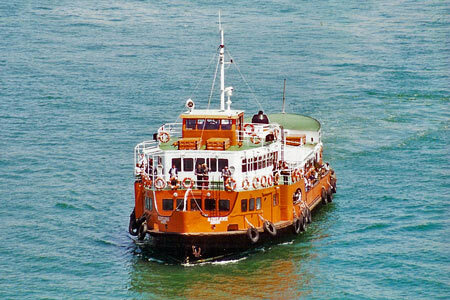 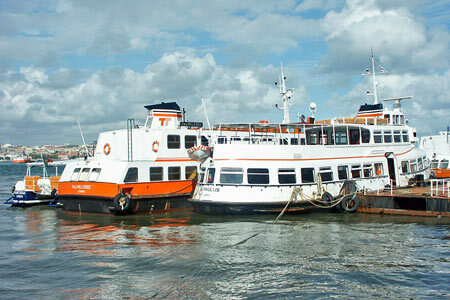 Transtejo had received a mixed fleet of ferries from various companies when nationalized in 1975. 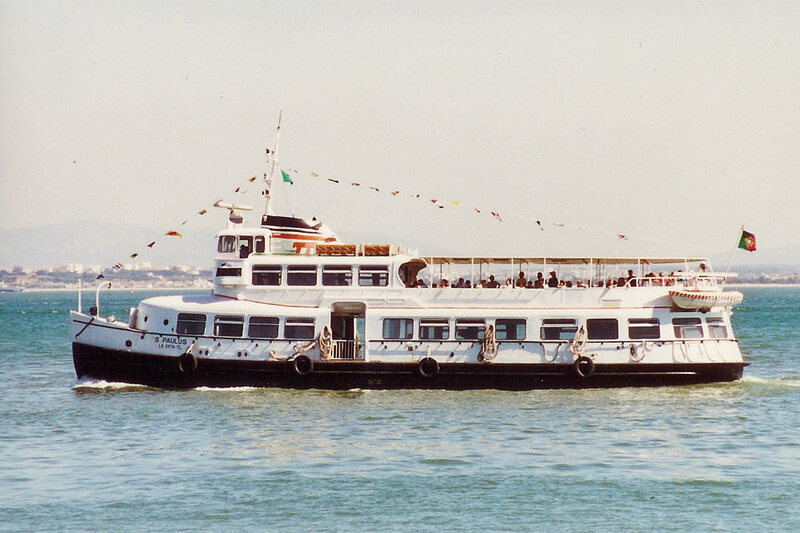 In 1980 the 300grt Cacilhense was delivered, the name ship of a new class of eight ferries. 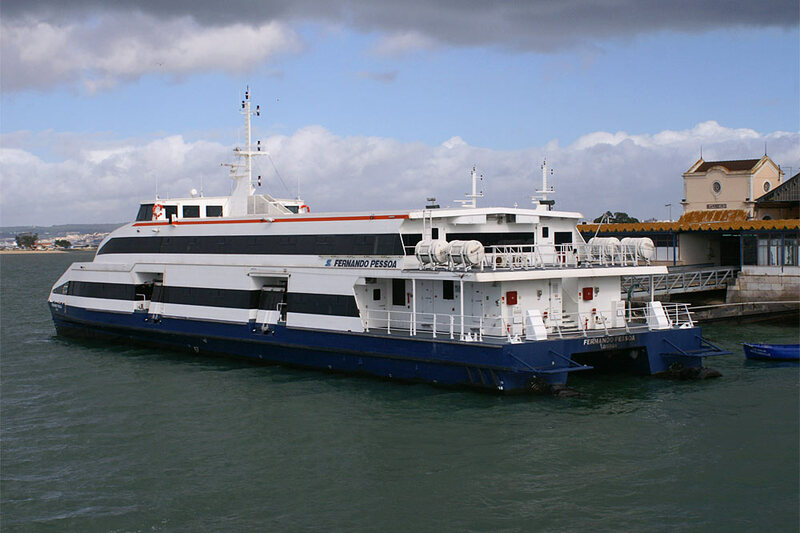 These are fully enclosed vessels and not particularly pleasant to travel on. The ships in the Cacilhense class were:- Cacilhense, Campolide, Dafundo, Madragoa, Montes Claros, Palmelense, Sintrense and Seixalense. 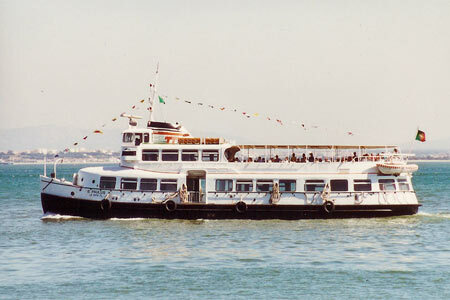 They were followed in 1982 by the four ships of the Monsanto class, similar to Cacilhense but featuring a bar and an open sided deck space aft, reducing tonnage to 280 grt. 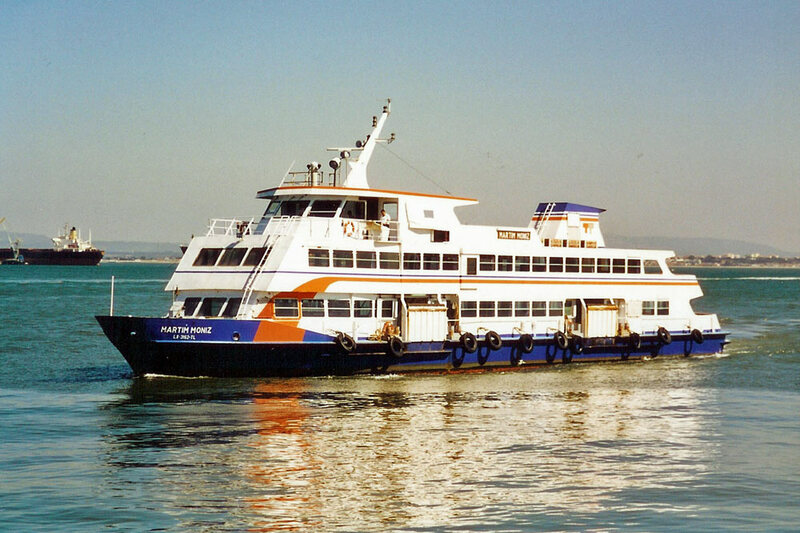 These were far more attractive to travel on compared to the previous Cacilhense class, but all four have now been withdrawn, along with the Cacilhense herself, replaced on most routes by the many fast ferries delivered since the mid-1990s. 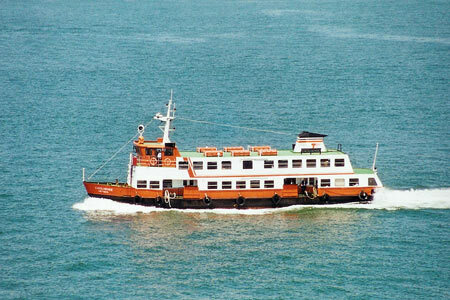 The Monsanto class consisted of Madre de Deus, Moscavide, Miratejo and Monsanto. 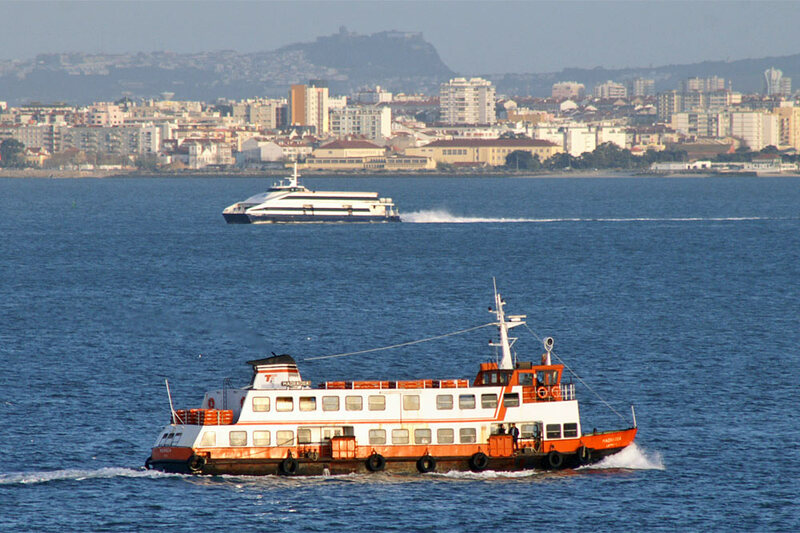 The service linking the railway station at Estacao do Sul e Sueste (also known as Terreiro do Paço, and adjacent to the Transtejo terminal at Cais da Alfandega) to the station at Barreiro had for many years been run by Caminhos de Ferro Portugueses (CP - Portuguese Railways). 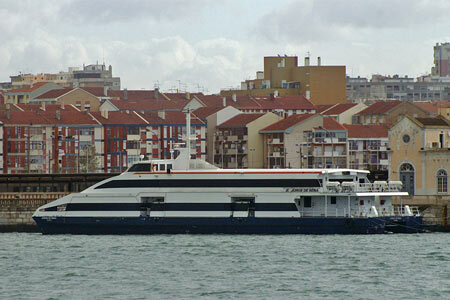 It was the government's intention to transfer Soflusa services to Transtejo. 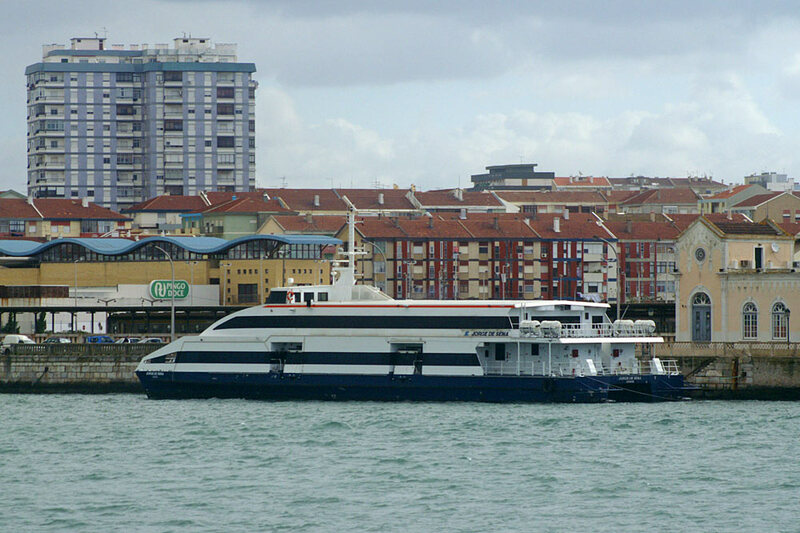 In 1992, the two large ferries Martim Moniz and S.Jorge were built in Germany for Transtejo, intended for a Cais de Sodré to Barreiro service. 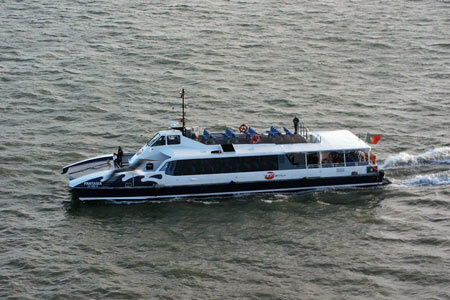 In the event, the service transfer did not take place and the two ferries were chartered to CP for their Barreiro service. In 1994, the railway ferries were transferred to a wholly owned subsidiary Sociedade Fluvial de Transports S.A. (known as Soflusa). 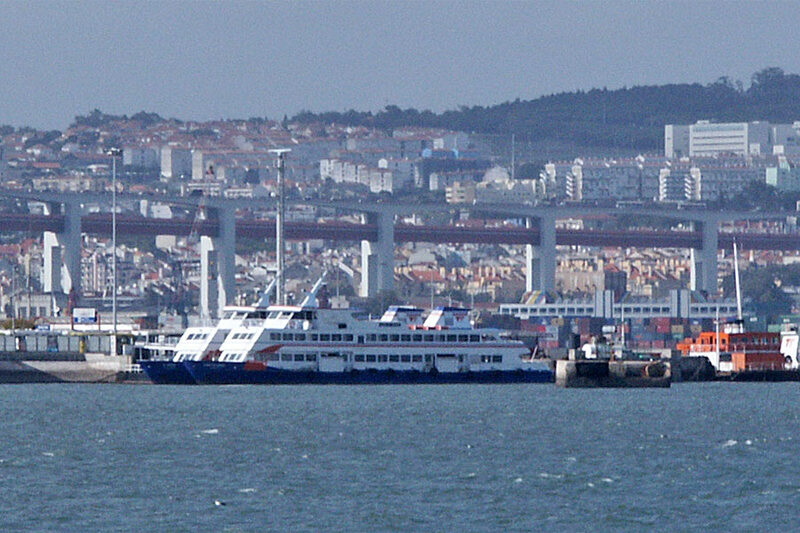 Barreiro was 30 minutes away by conventional ferry on the south bank of the Tagus. 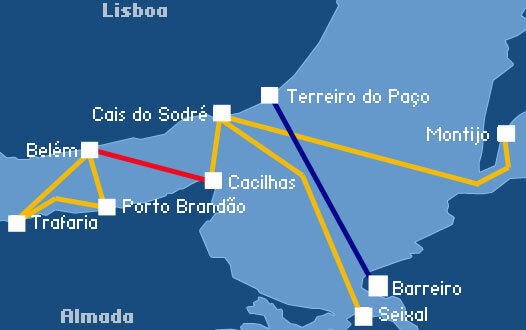 Trains left Barreiro for the south of the country, although the addition of a railway across the Tagus bridge replaced most of these routes. 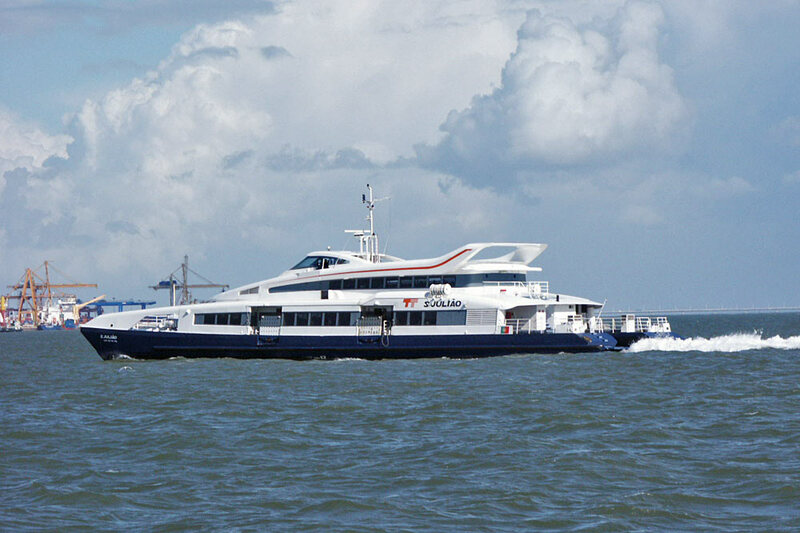 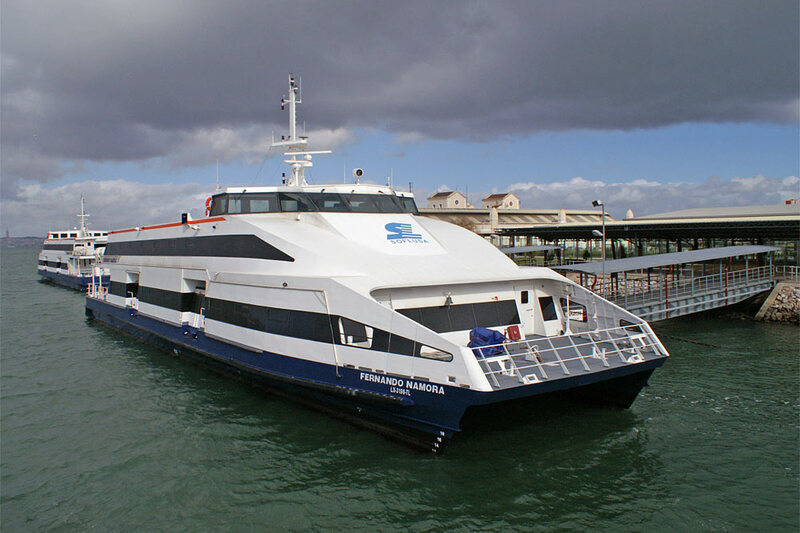 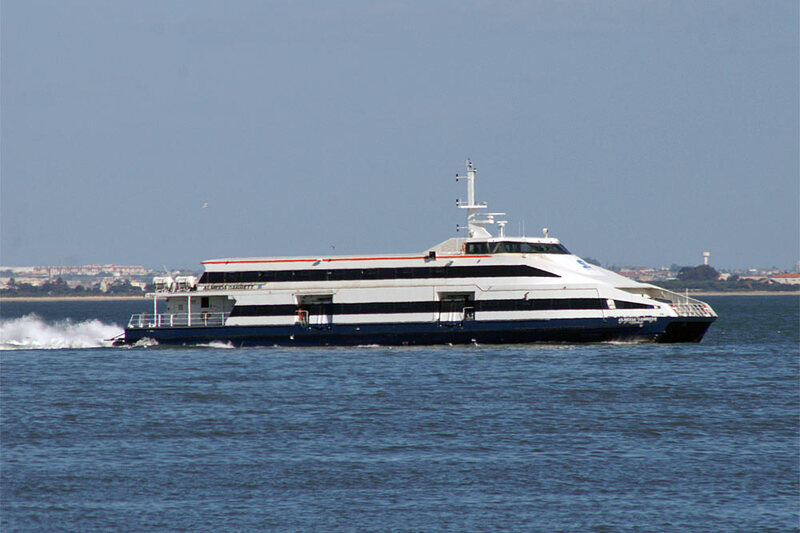 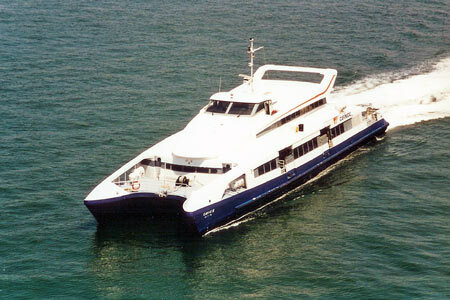 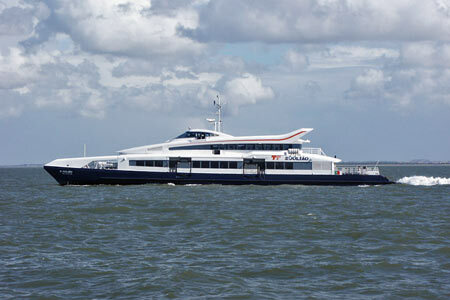 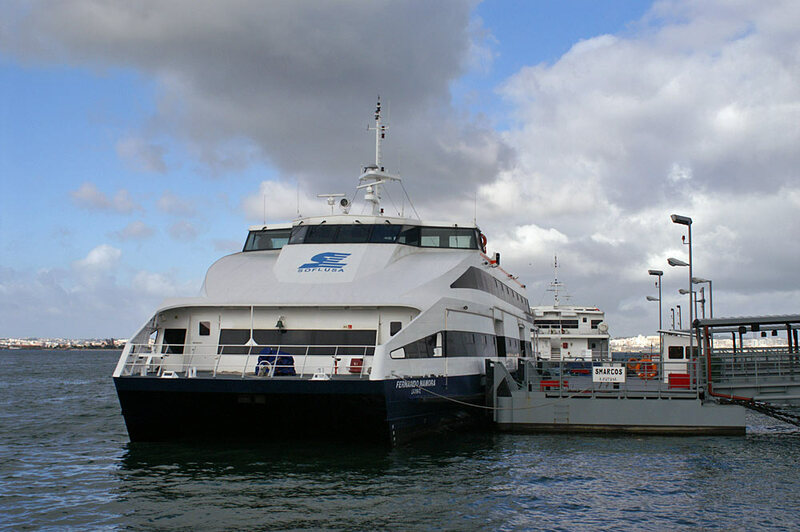 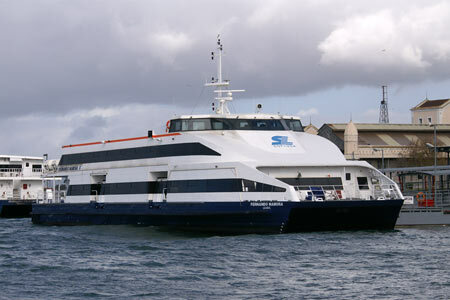 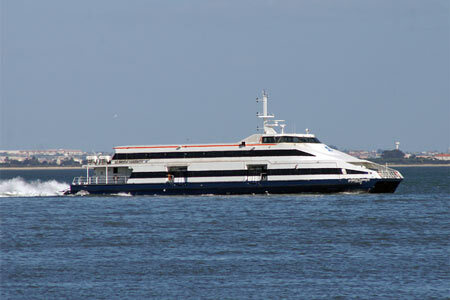 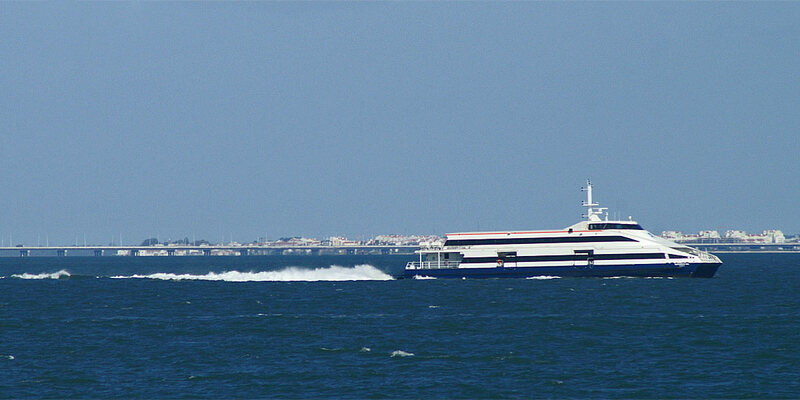 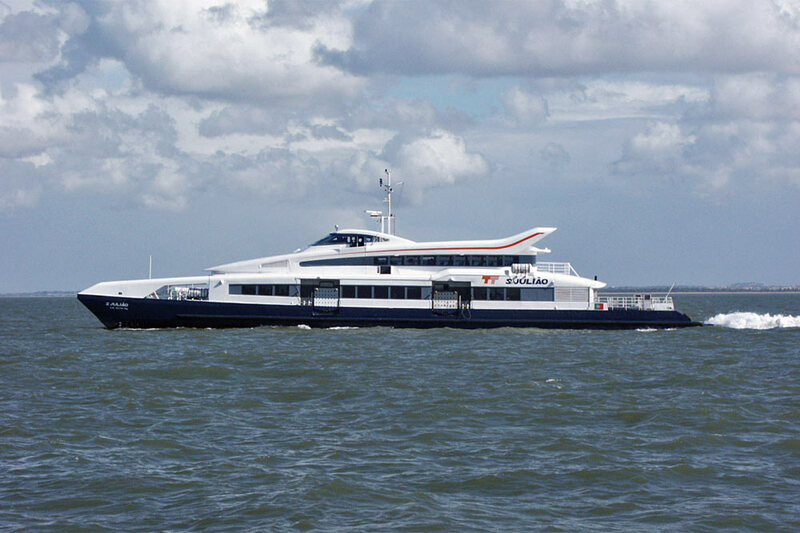 Soflusa had eight conventional ferries of their own, plus the two on charter from Transtejo. 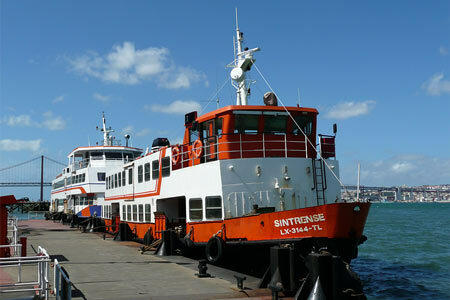 The conventional ferries have been replaced on this service by nine large fast ferries, which have cut the passage time considerably. 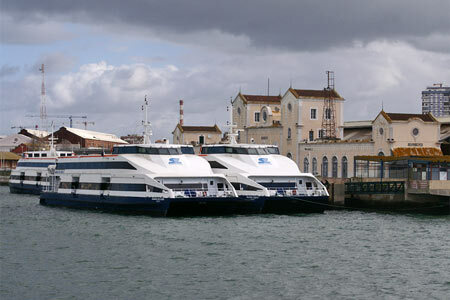 Despite losing many of its train services, Barreiro still acts as a large bus terminus, and ferries still leave every 5/10 minutes at peak periods. 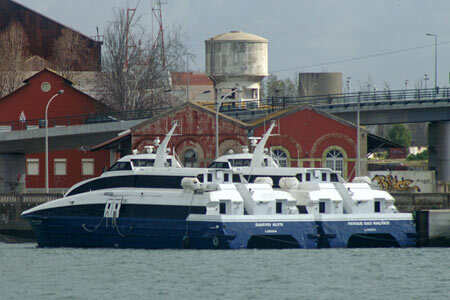 More recently, Transtejo and Soflusa have combined as Transtejo e a Soflusa (although each retaining slightly different management structures). 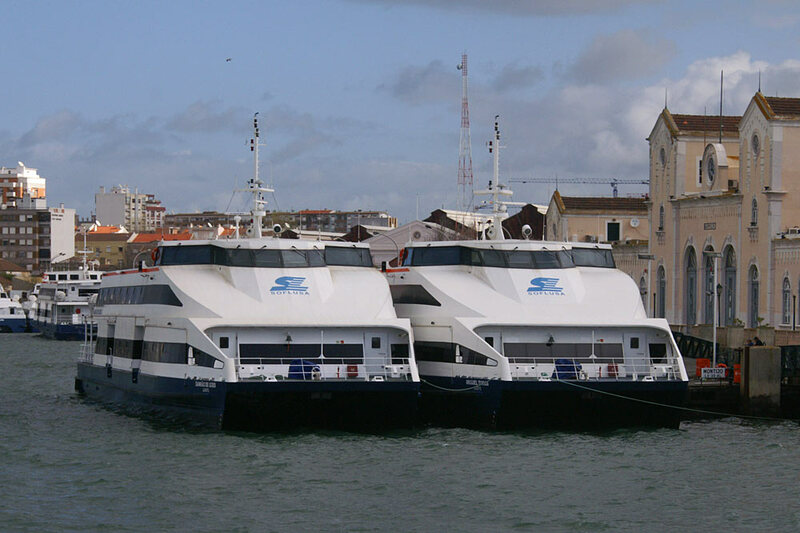 The mainstay of the Barreiro services for many decades were six 1000 passenger ferries built in pairs between 1961 and 1970:- Algarve (1961), Estremadura (1961), Minho (1968), Trás-os-Montes (1968), Alentejo (1970) and Lagos (1970). These were purposeful looking vessels of 701 gross tons which had a small area of open top deck. They were joined in 1978/79 by two larger 1600 passenge ferries, the Tunes and Pinhal Novo. These look like stretched versions of the Cacilhense class and had no external deck space. 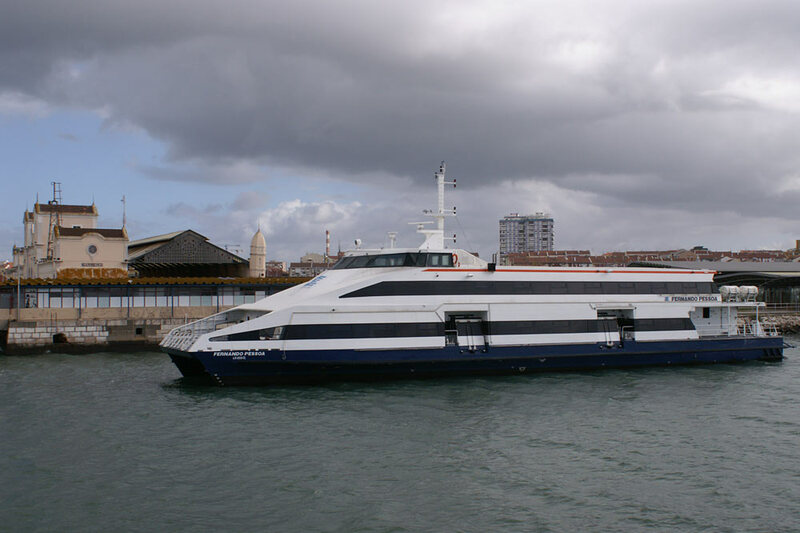 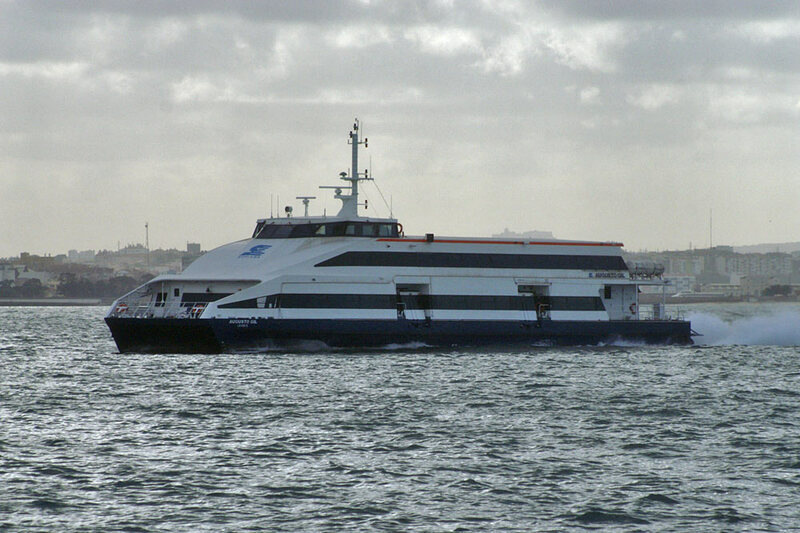 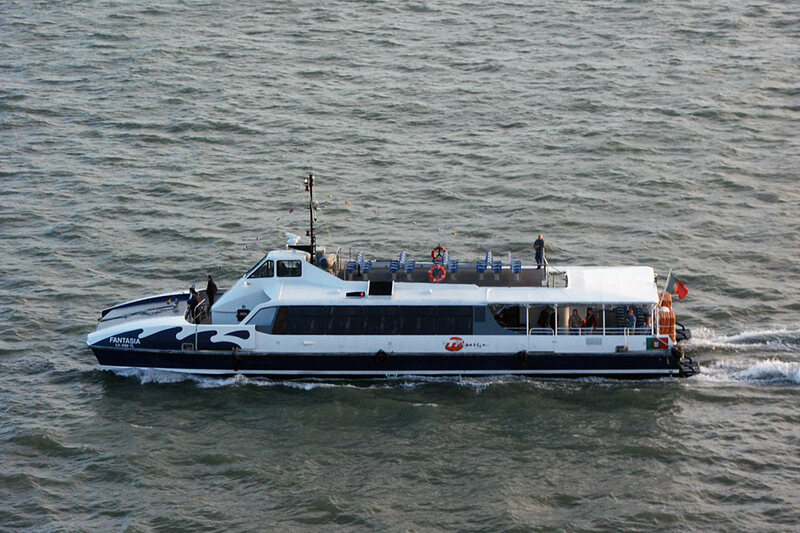 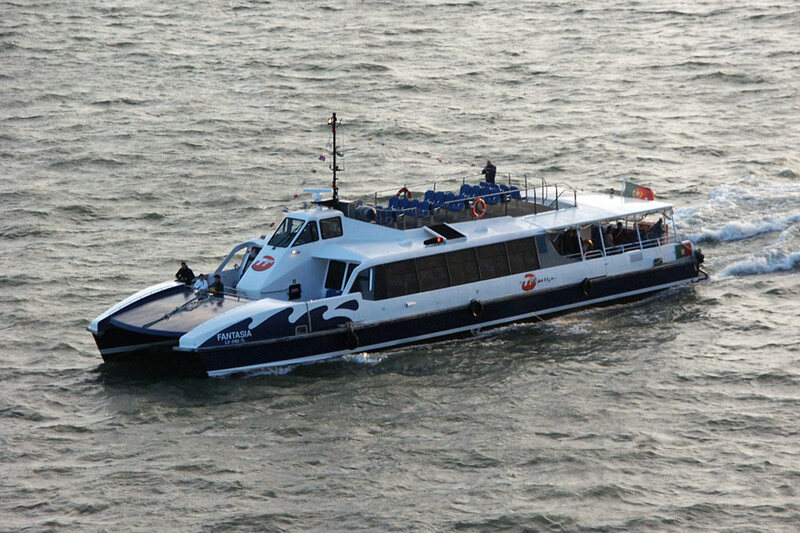 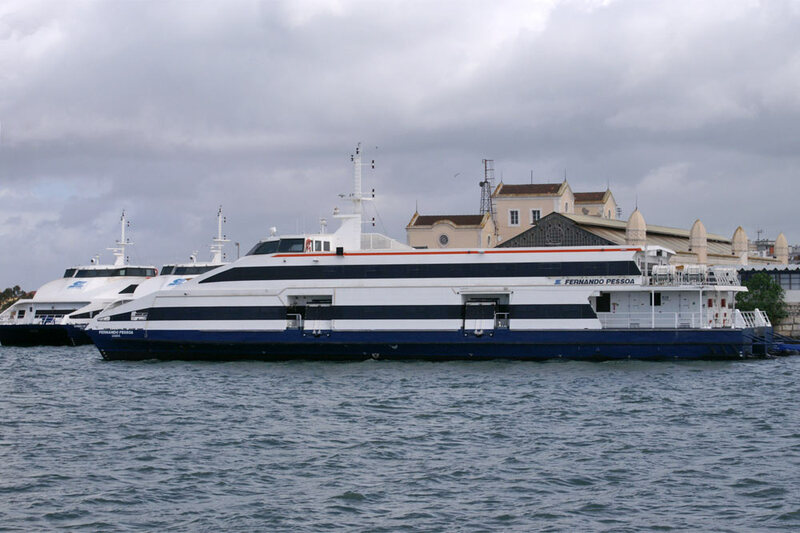 All of these conventional ferries were withdrawn in the mid-2000s when new fast catamarans arrived, Tunes and Pinhal Novo surviving longer than the smaller ships for use on peak period extras. 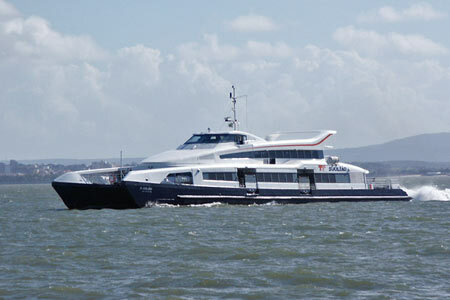 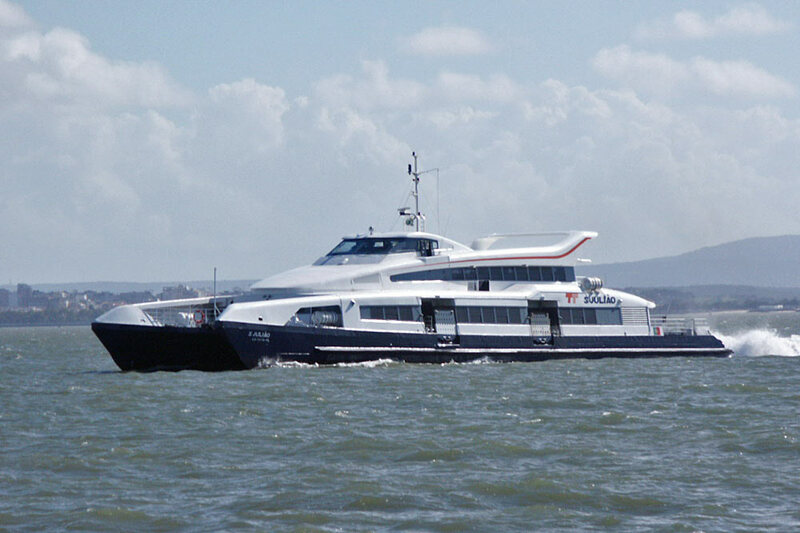 Damião de Goes was the first of a series of nine large catamarans built by Damen Shipyards, Singapure for use by Soflusa on the Barreiro-Terreiro do Paço route. 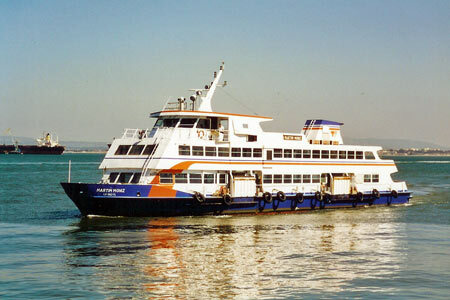 The complete list is:- Damião de Goes (2003), Augusto Gil (2003), Miguel Torga (2003), Fernando Namora (2003), Gil Vicente (2003), Jorge de Sena (2003), Almeida Garrett (2004), Fernando Pessoa (2004) and Antero de Quental (2004). 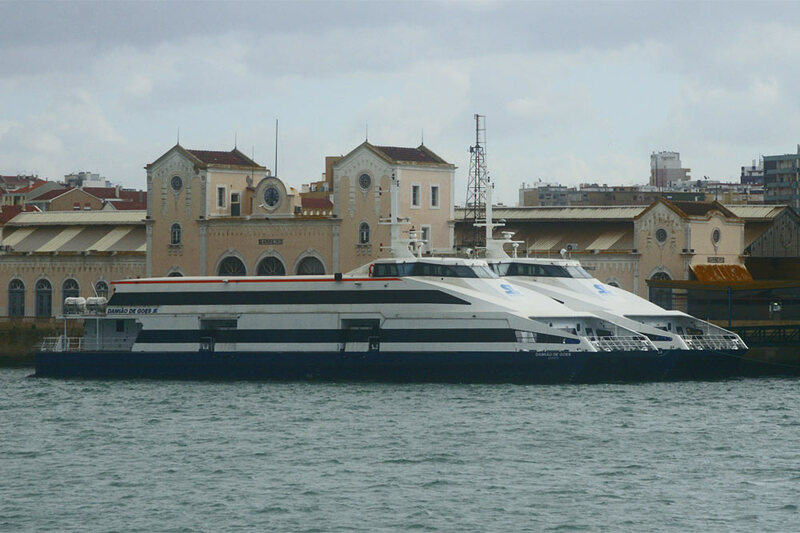 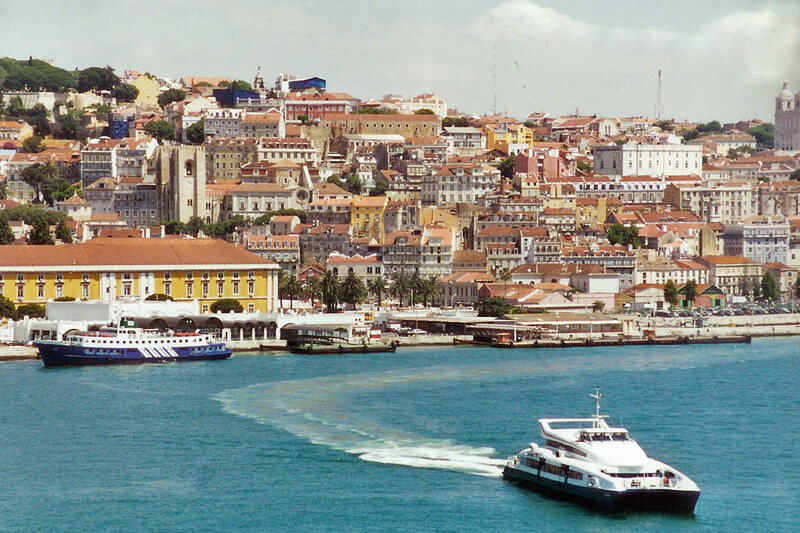 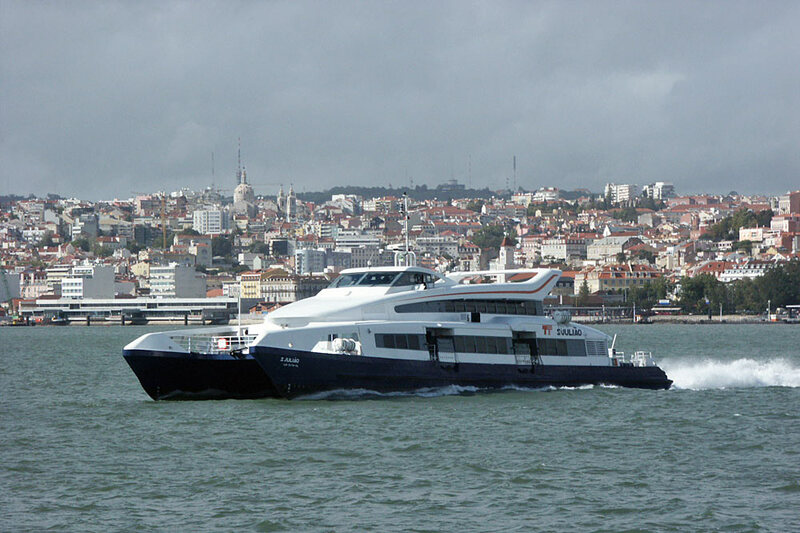 When I visited Lisbon in October 2003, I was lucky to see five of the six 1960s ferries still in service, since the first four new catamarans had already arrived. 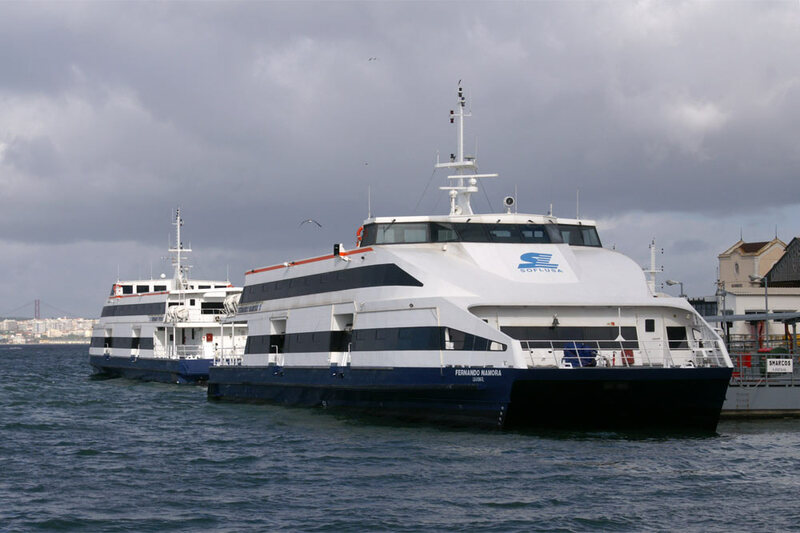 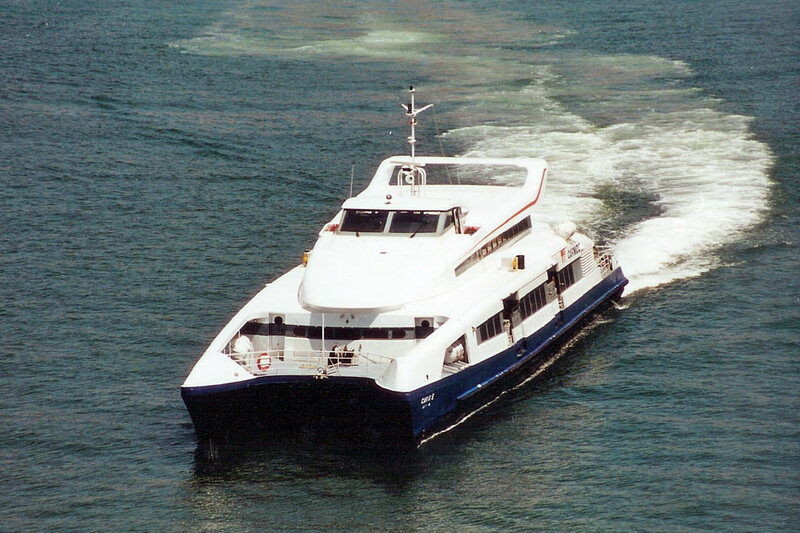 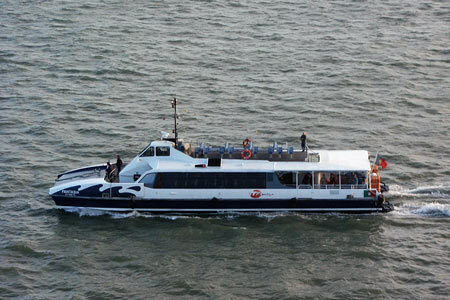 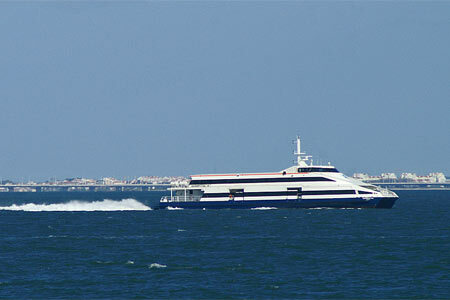 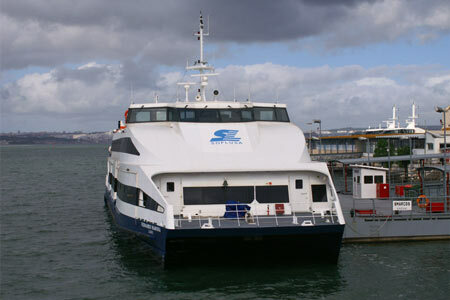 In 2008, six basic Transtejo e a Soflusa routes remain, operated by 22 fast catamarans, 2 car ferries and 14 conventional ferries. Transtejo e Soflusa - Lisbon combined ferry fleet in 2008 - this page! 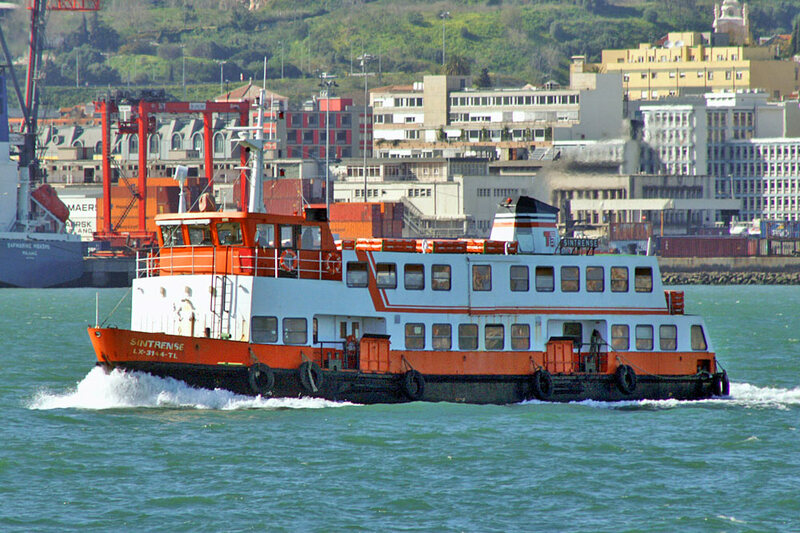 In 2008, just two car ferries remained, the Alentejense (1957) and Eborense (1954 - shown above). 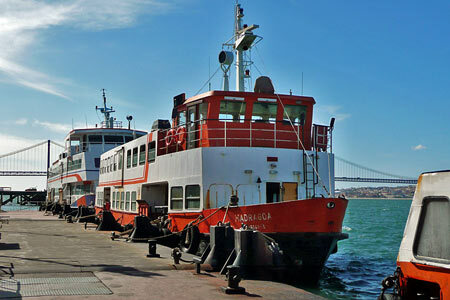 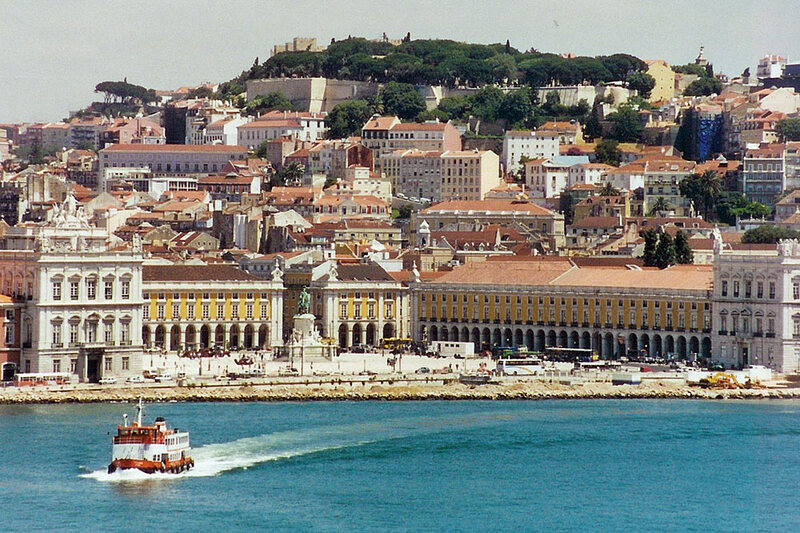 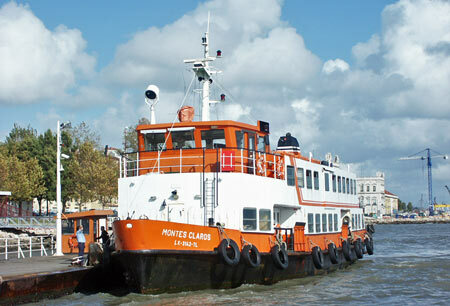 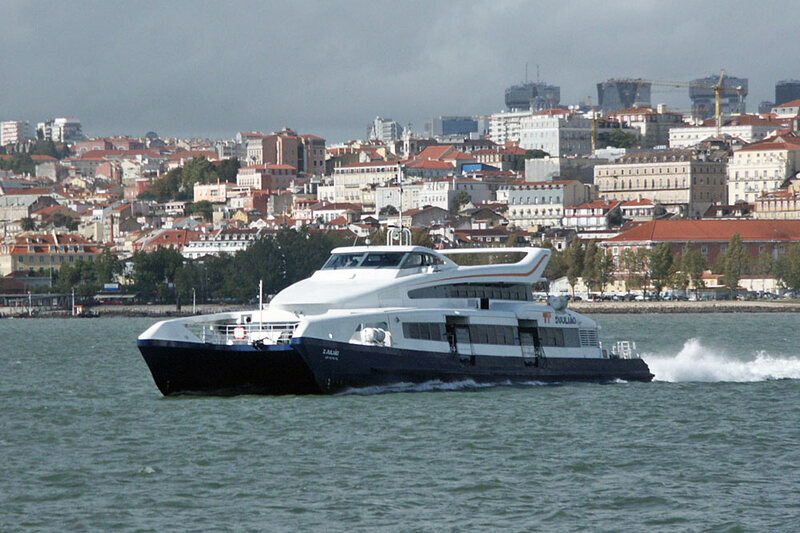 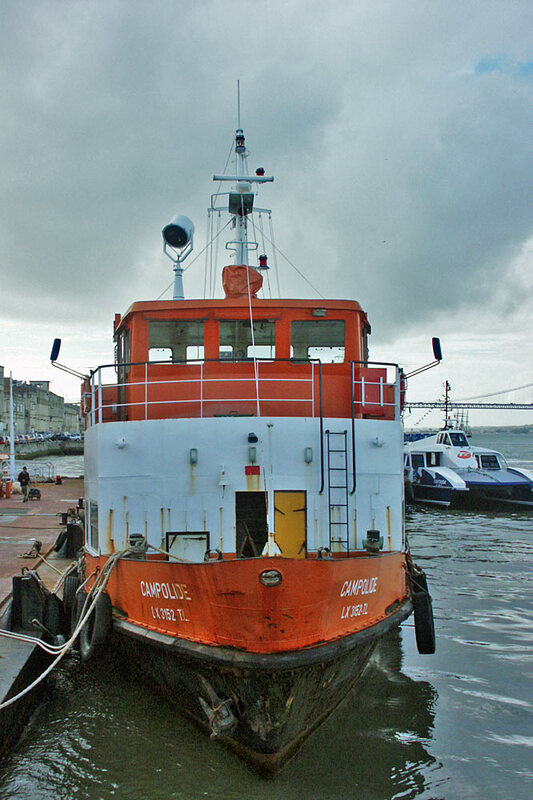 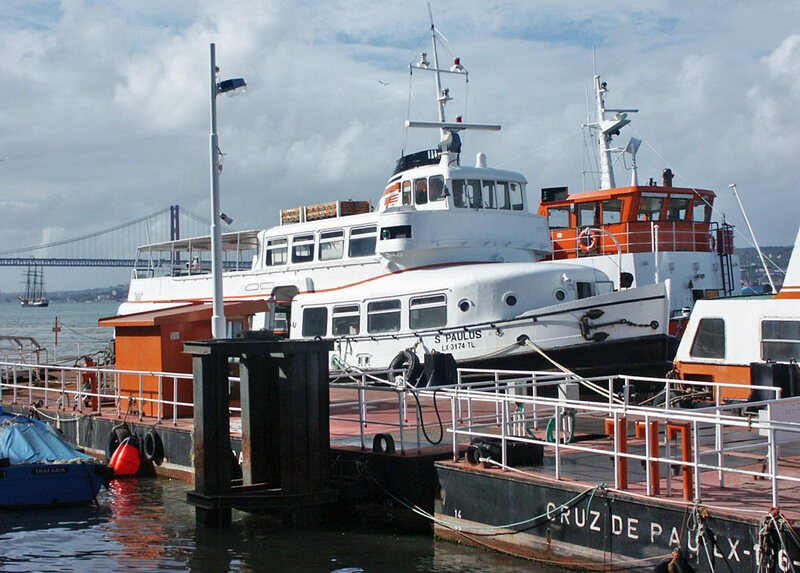 Following the rebuilding of Cais de Sodré terminal, the service runs from Cacilhas to Belem. 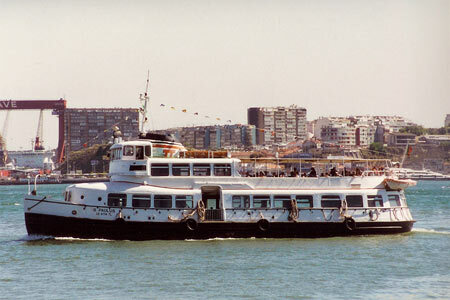 Eborense was built in 1954 by Estaleiros Navais de Viana, rebuilt in 1991 and re-engined in 2004. She is 50.25 m long, 460 gross tons and can carry 346 passengers and 30 cars (or 2 trucks). 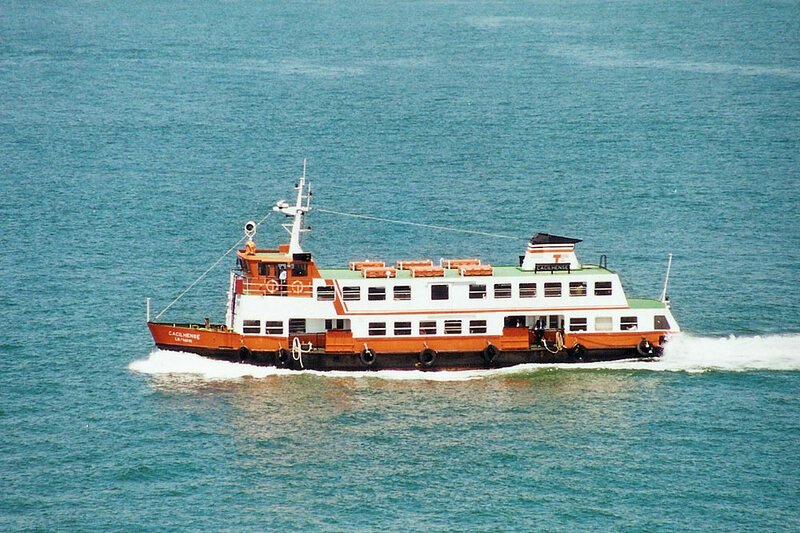 She has a speed of 11 knots. 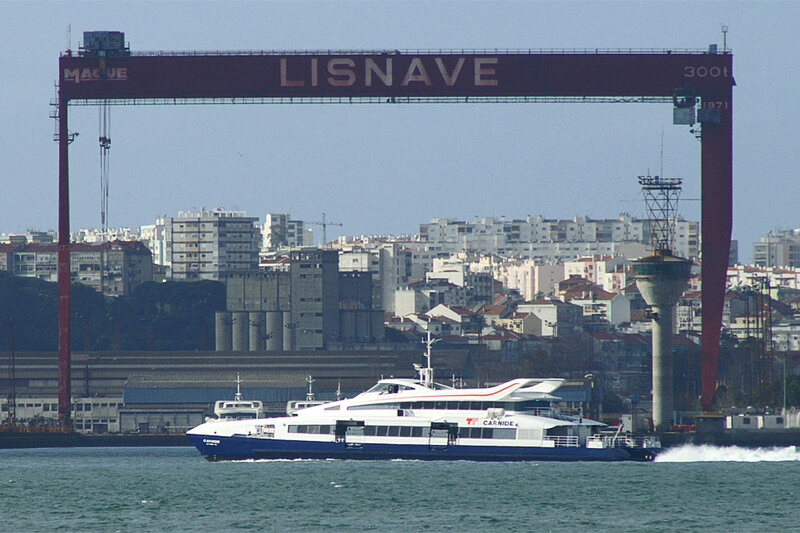 Built in 1957 by Estaleiros Navais de Viana do Castelo. 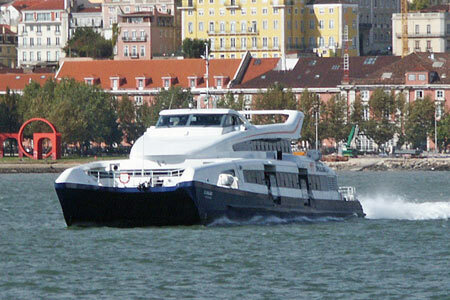 The original Sulzer 650hp engine was replaced in 1991 by a 495hp MTU engine giving an operating speed of 10km/hr. Until 1983 used on the route to Montijo but since then on the Cais do Sodré to Cacilhas service, remaining in service in 2008 between Cais do Sodré and Belem. In 1980 the 300grt Cacilhense was delivered, the name ship of a new class of eight ferries which replaced older ferries in the fleet. 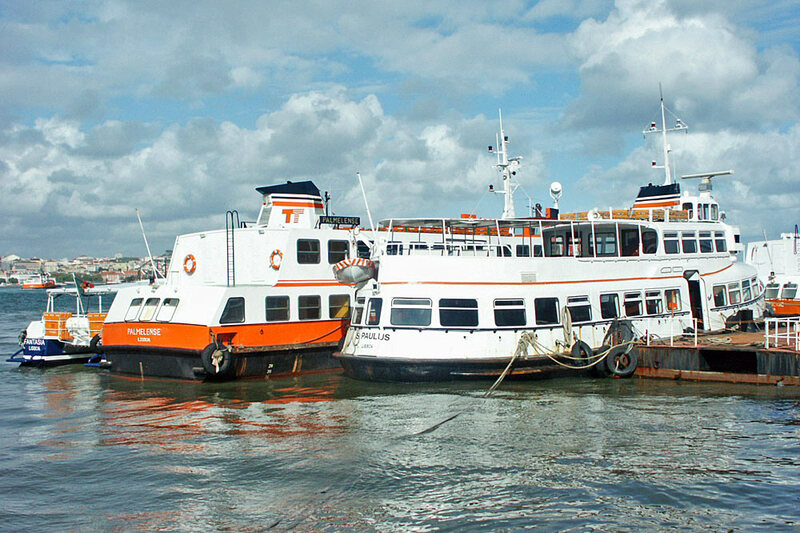 These are fully enclosed vessels and not paritularly pleasant to travel on as a tourist or enthusiast. 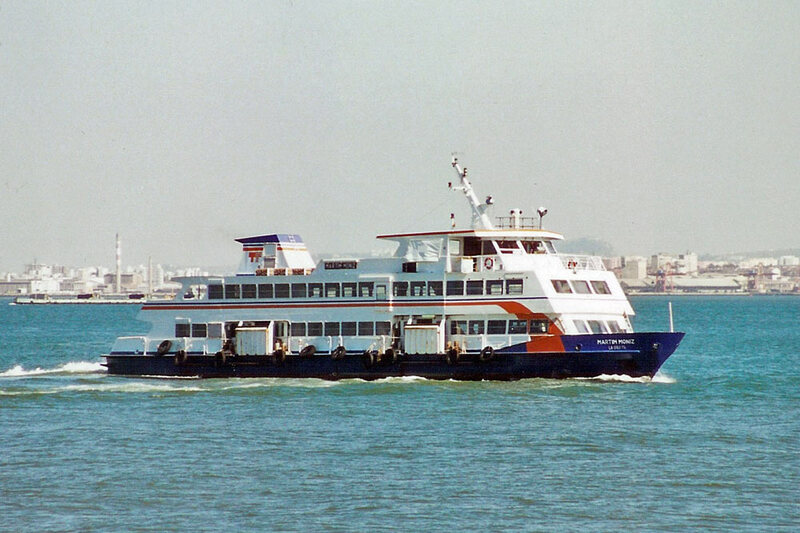 They were followed in 1982 by the four ships of the Monsanto class, similar to Cacilhense but featuring a bar and open sided deck space aft, reducing tonnage to 280 grt. 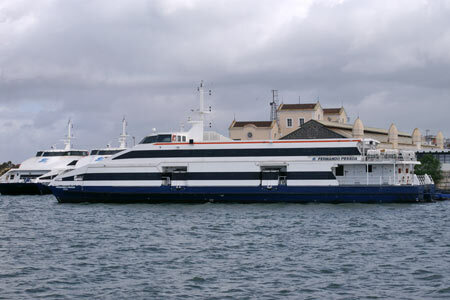 These were far more attractive to travel on compared to the previous Cacilhense class, but all four have now been withdrawn, along with the Cacilhense, replaced on most routes by the many fast ferries delivered since the mid-1990s. The surviving ships in the Cacilhense class are the Campolide, Dafundo, Madragoa, Montes Claros, Palmelense, Sintrense and Seixalense. 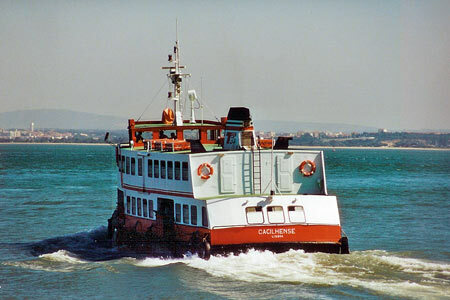 Cacilhense has recently been withdrawn, but as the name ship of the class is shown for completeness. Five Elbe ferries were bought from Hamburg operator HADAG in 1977. 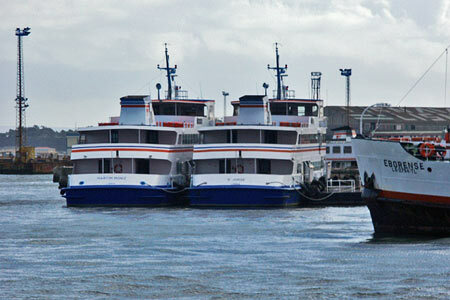 These were the Castelo (ex-HADAG Lichtwark), Marvila (ex-HADAG Volksdorf), Mouraria (ex-HADAG Ottensen), Porto Brandao (ex-HADAG Falkenstein) and Vouga (ex-HADAG Otmarschen). Marvila and Mouraria remain in the 2008 fleet. 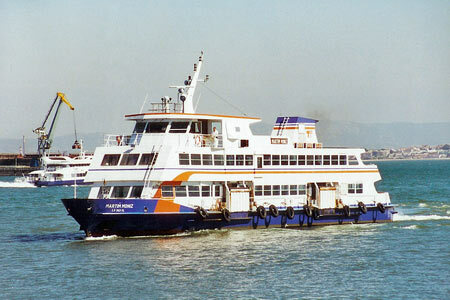 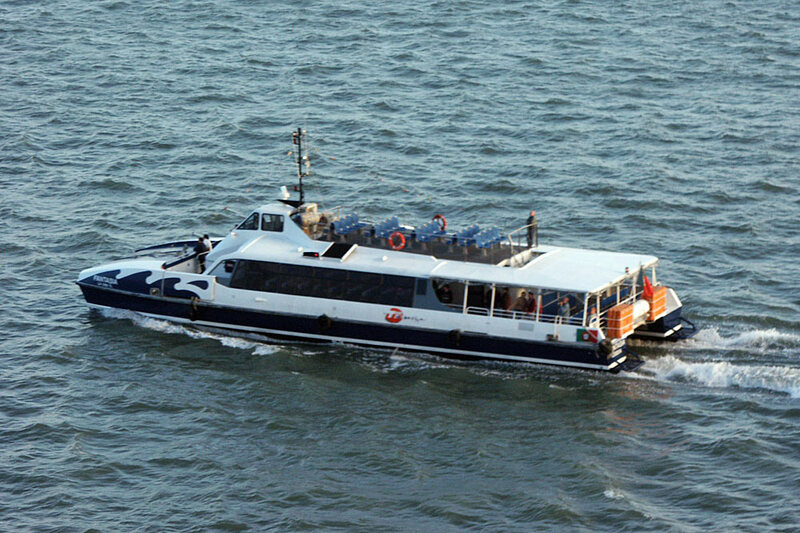 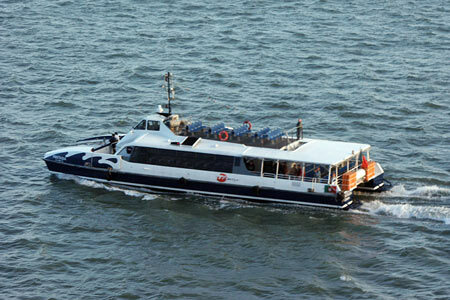 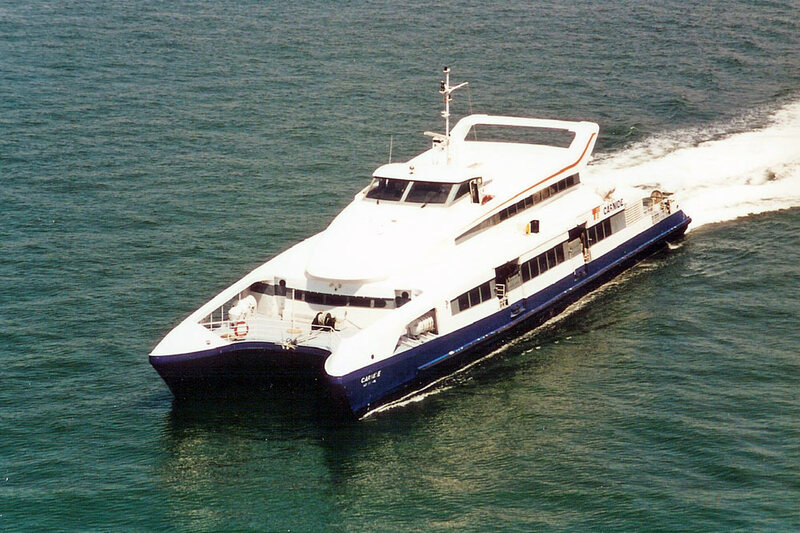 Two further HADAG ferries were acquired in 1999. The St Pauli, ex-Sulldorf of 1959 (renamed in 1978) became the S.Paulus, and the Pöseldorf became the Trafaria Praia. 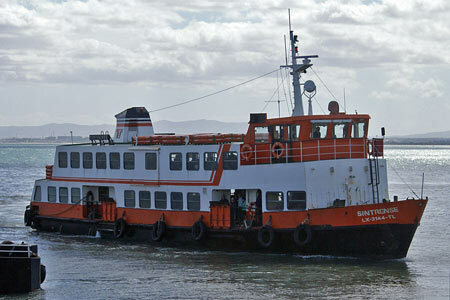 I only have images of S.Paulus so far. 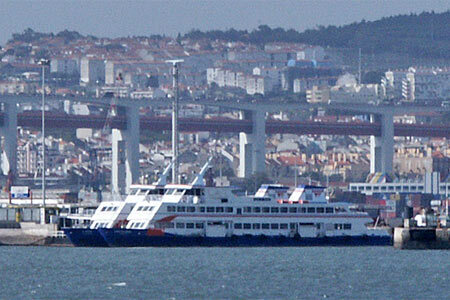 Martim Moniz is one of two large ferries delivered to Transtejo in 1992, the other being the S.Jorge. 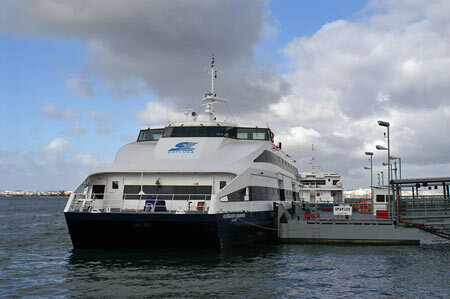 They are both of 650 grt, and carry 1000 passengers. 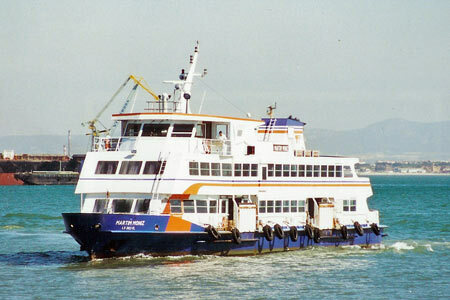 Both sisters were chartered to Soflusa until newer fast ferries arrived, for service to Barreiro. 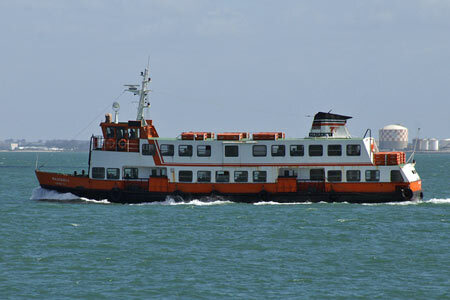 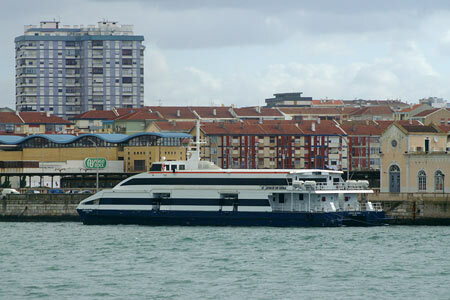 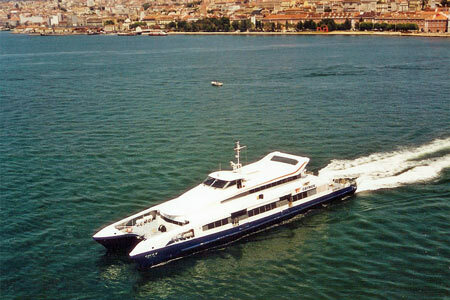 S.Jorge is one of two large ferries delivered to Transtejo in 1992, the other being the Martim Moniz. 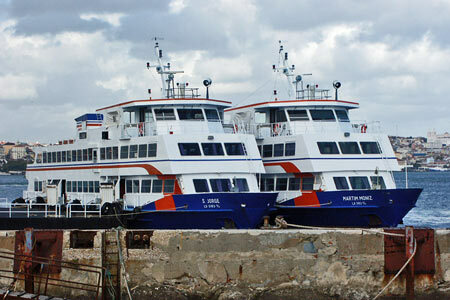 They are both of 650 grt, and carry 1000 passengers. Both sisters were chartered to Soflusa until newer fast ferries arrived, for service to Barreiro. The mainstay of the Barreiro services for many decades were six 1000 passenger ferries built in pairs between 1961 and 1970:- Algarve (1961), Estremadura (1961), Minho (1968), Trás-os-Montes (1968), Alentejo (1970) and Lagos (1970). These were purposeful looking vessels of 701 gross tons which had a small area of open top deck. They were joined in 1978/79 by two larger 1600 passenge ferries, the Tunes and Pinhal Novo. These look like stretched versions of the Cacilhense class and had no external deck space. 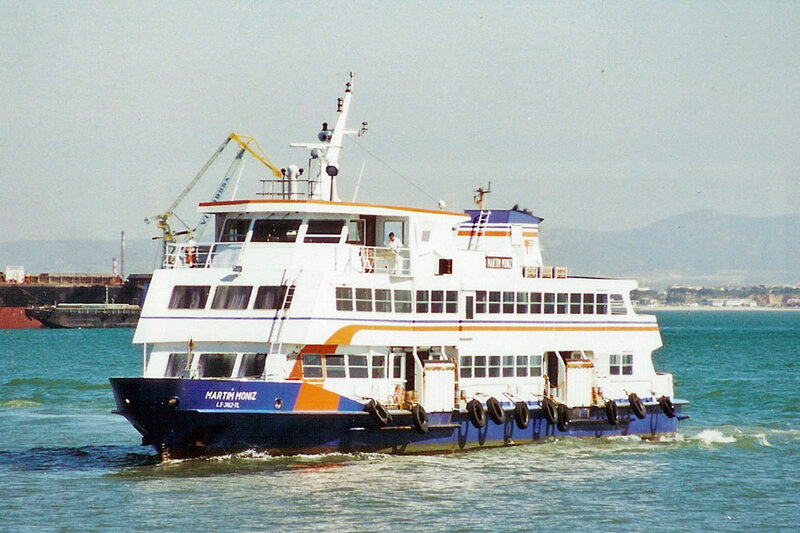 In 1992, the two large ferries Martim Moniz and S.Jorge were built in Germany for Transtejo, intended for a Cais de Sodré to Barreiro service. In the event, the service transfer did not take place and the two ferries were chartered to CP for their Barreiro service. 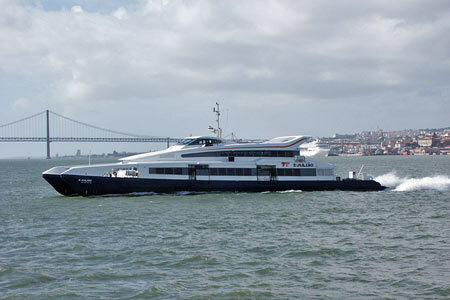 Damião de Goes was the first of a series of nine large catamarans built by Damen Shipyards, Singapure for use by Soflusa on the Barreiro-Terreiro do Paço route. 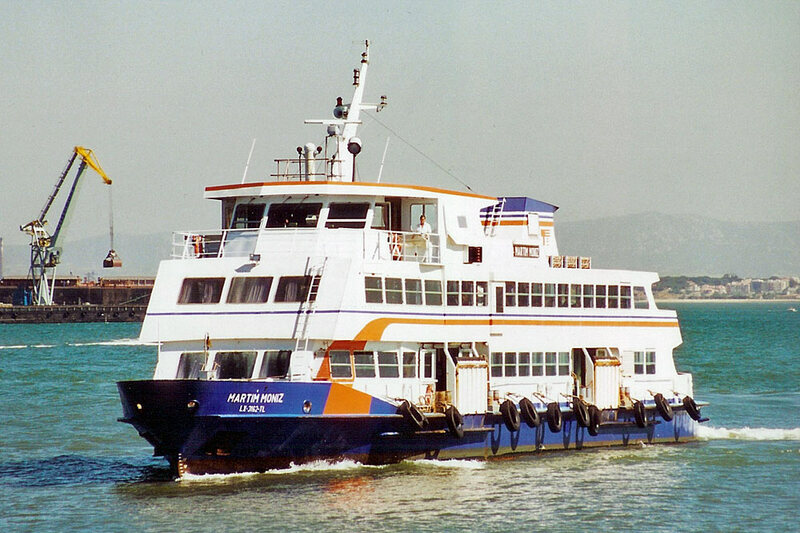 They were all delivered in 2003/2004 and replaced all the conventional ferries on the route. Tunes and Pinhal Novo survived longer than the smaller ships for use on peak period extras until the complete catamaran fleet was delivered. 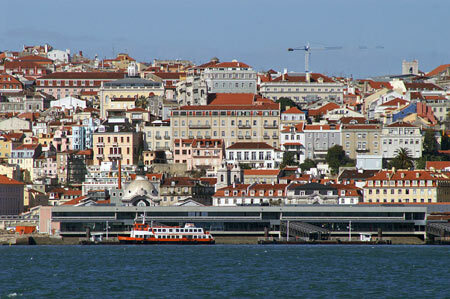 Martim Moniz and S.Jorge survive with Transtejo for use on other routes. 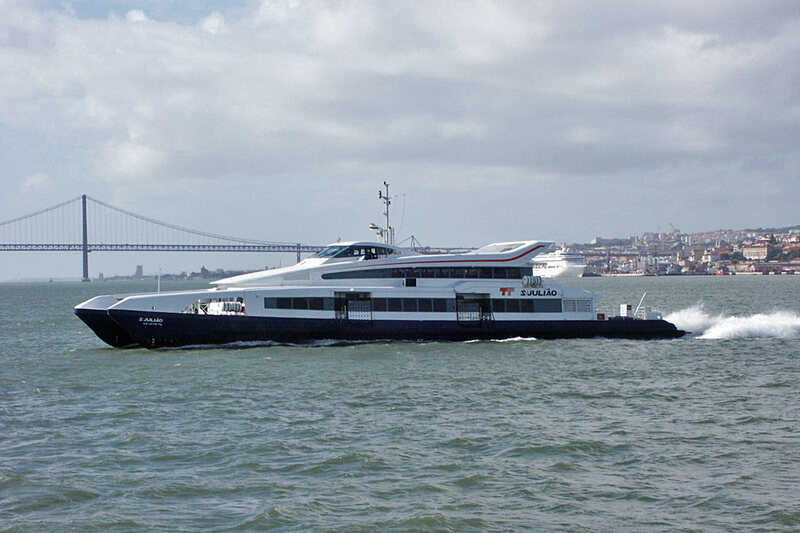 The complete list of new catamarans is:- Damião de Goes (2003), Augusto Gil (2003), Miguel Torga (2003), Fernando Namora (2003), Gil Vicente (2003), Jorge de Sena (2003), Almeida Garrett (2004), Fernando Pessoa (2004) and Antero de Quental (2004).